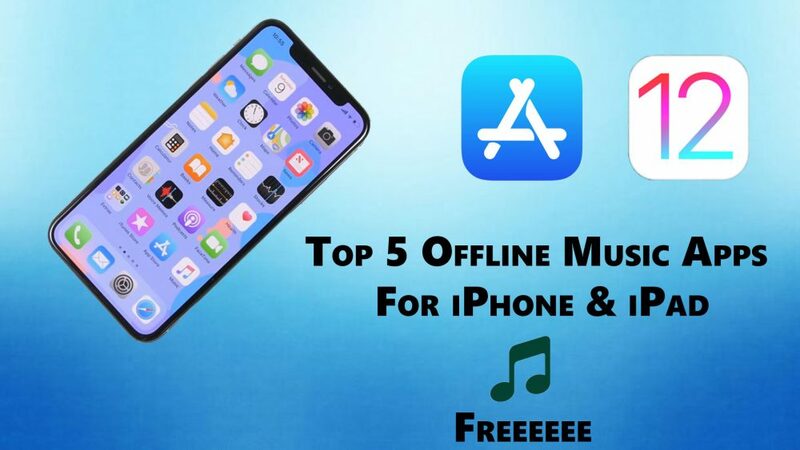 5 offline music apps for iPhone & iPad – Hello guys, in this article, I’m going to show you top 5 offline music apps for iPhone & iPad. guys these offline music apps are the best of 2018 and the best thing is that you can download them from the app store that means you don’t need to jailbreak your iPhone & iPad. and the best thing is that you can download all of them for free. so you don’t need to waste a single penny. so let’s go further guys and have a look at these 5 best offline music apps for iPhone & iPad. If you open this app then you will see its home screen. where you will have different tabs at the bottom. you will have trending, discovery then you will have your favorites then you will have the history of the songs that you have played on this app and then, of course, you will have the settings of this app. so of course, you want to play a song and save offline what you guys need to do just go to discovery and search for any song, any artist that you want. Once you have found the song that you want to save then the process is pretty simple. on the right side, you will see the plus sign. so go ahead and tap on the plus sign then you will see a pop. just click on the (save offline to playlist) to save that song to listen to offline. So to find that song, just go to the trending then you will there my songs tab and here you will see that song. so you will see here the playlist of the songs that you have saved to play offline. This is easily one of the best apps that allows you to save music for offline listening. if you open the app then you will see the home screen of the app. on the home screen, you will the browser section. so you can go to the browse section to browse like different music then you will have the library and then you will have a search bar as well. So to save song offline, just tap on that song then you will see a plus button. so click on the plus button and it will save the song to your library. so you can go ahead and listen to it offline. On the home screen of the app, you can discover different music. so you will have the three tabs on the home screen (the music, artist, and genres). also, you will have the search bar, where you can search for any song or any artist that you want. So let me tell you, how you can save any song to listen to offline. so click on any song that you want then click on a little down arrow button and then choose the format and then click on the download button and then it will save that song to listen to offline. Player GR is another awesome app that allows you to save music for offline listening. so if you open this app then you will see the home page of the app, where you will see a search bar. so you can search for any song & any artist that you want and then you will have your favorites then you will have the history. To save any song for listening offline, you don’t need to do anything. just play any song that you want and it will start saving automatically. so this is pretty simple. This one also allows you to save music for listening offline. if you open it then you will see its home screen, where you will have different sources. so go to the SoundCloud and here you can search for any song to listening. To save any song for listening offline, just play any song and then click on the little down arrow button and it will start save that song for listening offline. So that’s pretty much for this article guys. this article was about the top 5 offline music apps for iPhone & iPad. hope you like these apps and the article and if you like this article then please don’t forget to share it and also visit daily on this website for reading more new articles.